It provides improved sound for computers and portable audio devices alike. "A friend asked me to develop a DAC that everyone could afford yet would substantially improve the sound of any conventional audio product," Says HiFiMAN president Fang Bian. "The result was the HM-101 which has exceeded even our high expectations." 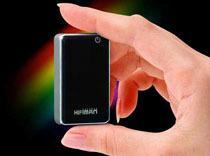 The HM-101 measures in at 2-1/2 inches long, 1-1/2 wide and 1/2 inch thick. It offers a USB connection for computers as well as a standard headphone jack so you can plug in your iPhone, CD player or whatever else could use an audio boost. HiFiMAN's new DAC has a signal to noise ratio of 98 dB and total harmonic distortion of 0.07 percent. It has a nice wide frequency response too, from 20Hz to 20kHz. The HM-101 is available now for $39.